This site is for internal testing purposes only. Please visit the IFAS Bookstore site to browse and place orders. 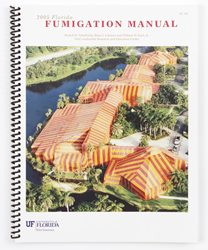 This is the all-in-one structural fumigation manual that Florida applicators and Certified Operators have been waiting for: the one general reference manual for persons seeking background information on their journey to becoming certified and licensed to perform structural fumigations in Florida. In fact, this manual is an excellent study reference for those taking the State Fumigation Certification and SPID Exams. Contains federal and state statutes--including hazmat and post-9/11 language. Full glossary of terms associated with Structural Fumigation. Full-color photographs make the text more memorable. Charts and tables make the product and safety labels more understandable. English. 137 pp.